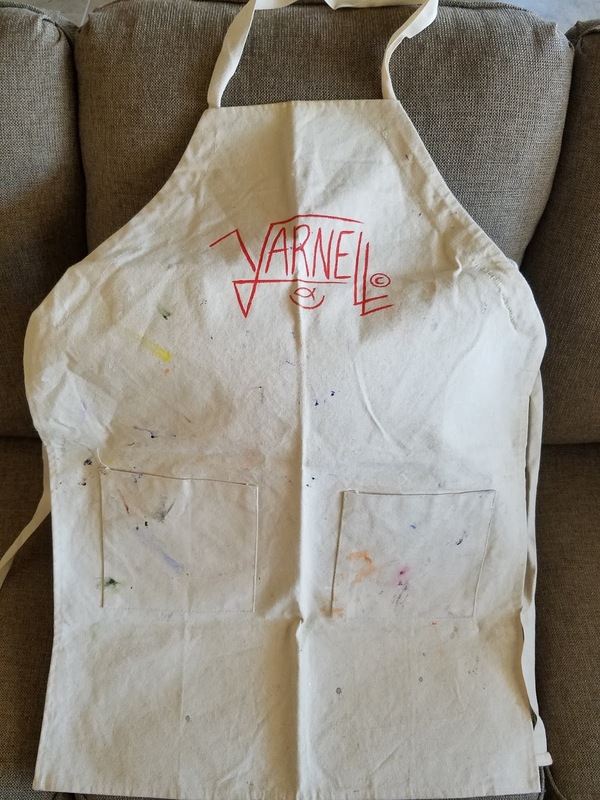 His apron captured his colors, and he wore that art. How wonderful to have. Yes, it's so wonderful to have this special heirloom. Thank you! Close call! So glad your friend attended the sale. That's quite a story, Jana! We had a similar experience with my Dad's fountain pen. I can understand your relief to be able to save such a special keepsake. Happy to hear your friend not only "saved" the apron for you but also other family history items and photos. I'm so glad too Cathy! I would be so sad to have those precious items lost. Thanks for stopping by! Just when you think you've been through everything! Glad your friend came to the rescue and the apron is safe at home where it belongs. Whew. That apron is a treasure, the sort of intimate item that was part of your dad's personality and profession. Interestingly, one of the items I chose to keep when it was my turn in the round-robin of selecting his personal mementos was his cooking apron. He made me breakfast every morning of my life and liked to wear an apron. Now I wear it too and it reminds me of him every time. Oh, your dad's cooking apron sounds like such a wonderful treasure. What fun memories it holds for you! Thank Goodness your friend found those! I have a jar of buttons that is a keepsake from my paternal Grandma and also my maternal grandfather had a jar of buttons. I combined them and have added my own. I know! I'm so grateful to my friend. A jar of buttons. What a fun treasure! Lucky your friend was on the ball and sensitive to the value of what would otherwise just have looked like a pile of junk. 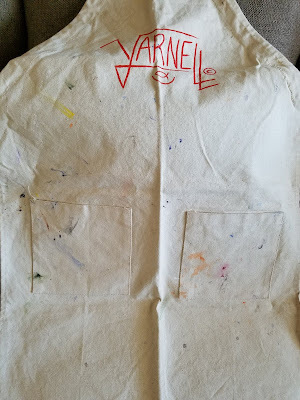 Remember to store the apron with a copy of it's origin story and this story as well, as it is these special stories that give it value, so that when the next generation find it they will understand why it's been kept so carefully. A wonderful story. Oh, these are such great ideas and such wonderful advice. Thank you so much! Good suggestion! I'll have to remember it. 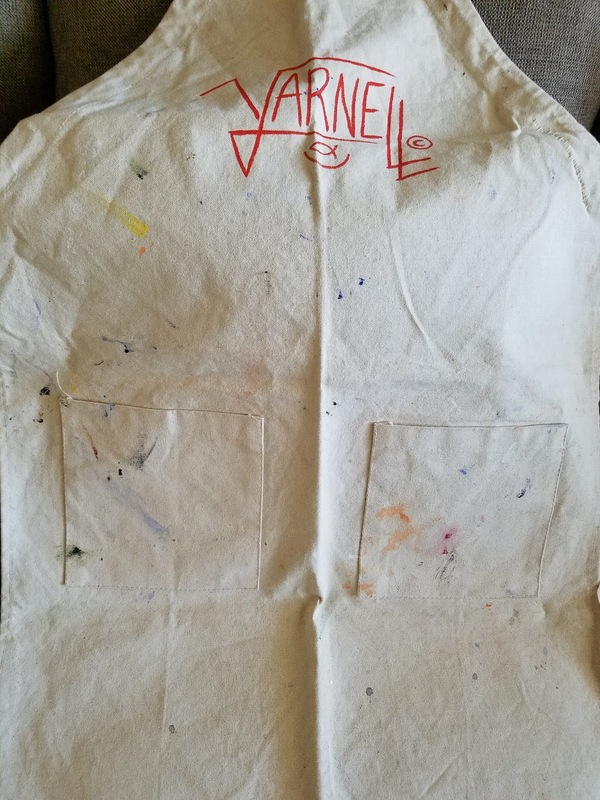 I have my grandmother's painting smock and my mother's "nursery school teacher" smock. So happy you were able to retrieve it. Those estate sales are emotional to get through - I'm glad it's all taken care of. Thank you so much Debi! I'm glad the estate sale is behind us now. So personally used - that's the best kind of heirlooms! So true! Thank you Laura! I feel for you Jana. When we had to let go of my parents' house, we never were able to locate my father's car keys, on which he kept his wedding band. (My sister drove them to the airport, so we doubt he took them with him.) We were careful too, but still, I wonder what we missed. I'm glad you'll have this apron to cherish. So glad your friend notified you! I'm so very glad too. Thanks for stopping by Amanda! What a treasure, Jana. Will you ever use it, do you think, or save it as an heirloom/keepsake? So glad your friend found the items in the closet and alerted you to them. Close call!